2016 has been a solid year for Russians competing in the Women's and Men's Doubles categories on the World Tour, and day three of the 2016 Belarus Open continued to support the evidence that Russian teamwork on the Tour is going from strength to strength. Yana Noskova and her partner Yulia Prokhorova are through to the Women’s Doubles last four, following a successful 3-0 victory in their match with Korea Republic’s Lee Zion and Yoon Hyobin. Korea has been a dominant force throughout the 2016 Belarus Open so far, but the Women’s Doubles event has seen a different picture painted, and the Russian duo capitalised on that fact as Noskova and Prokhorova hammered their way to the win (11-5, 11-4, 11-8). Only one Korean combination remains in the draw and that is the partnership of Park Seri and Jung Yumi, after they claimed a clean sweep win over Puerto Rican sisters Adriana and Melanie Diaz. Valentina Sabitova and Anna Blazhko (both Russia) crashed out to Japan’s Hitomi Sato and Honoka Hashimoto in the other quarter-finals match. The Men’s Doubles competition is guaranteed to see Russia take on Korea Republic in the final, as both nationalities were kept in separated halves of the semi-final draw. Russia will see two of their Doubles teams go head-to-head in the bottom half of the semi-finals draw, after Grigory Vlasov and Kirill Skachkov overcame Ukraine’s Denys Kalachevskyi and Alexei Kaulick, while Sadi Ismailov and his partner Konstantin Chernov battled past Huang Chein-Tu and Yang Tzu-Yi of Chinese Taipei. Park Ganghyeon and Kim Minhyeok will take on Jang Woojin and Kim Jonghoon in an all-Korean last four match in the top half of the draw. 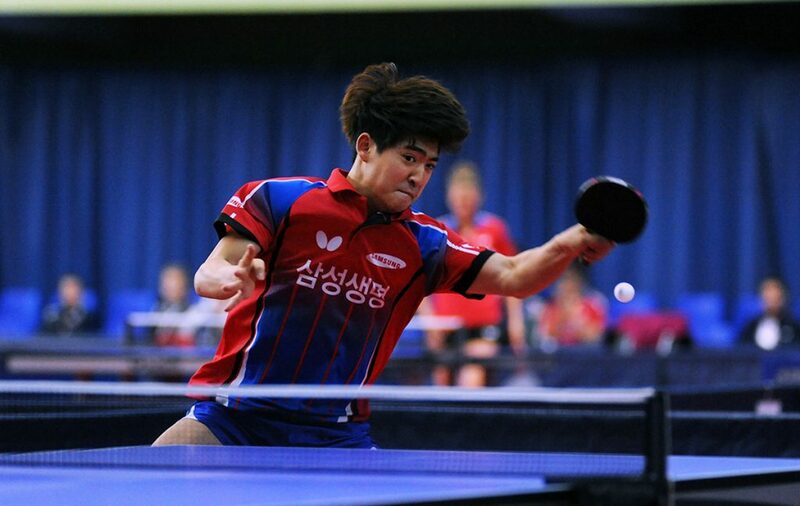 Jang and Kim.J came through their quarter-finals tie in straight games eliminating Russia’s Andrei Baibuldin and Viacheslav Burov, but Park and Kim.M endured a tough ride prior to achieving qualification to the next round. Ukraine’s Viktor Yefimov and Yevhen Pryshchepa were leading 1-2 in the first to three games encounter, heaping a tremendous amount of pressure onto their opponents’ shoulders. But Park Ganghyeon and Kim Minhyeok kept calm and responded with back-to-back game wins to seal a 3-2 victory (11-4, 12-14, 6-11, 11-6, 11-6).